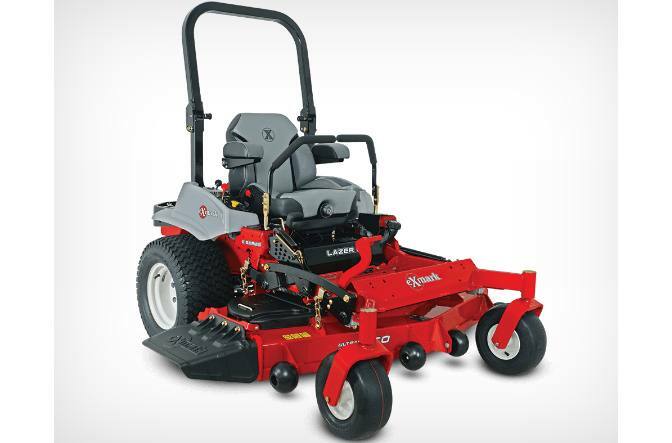 The perfect choice for professional landscape contractors who want the innovative engineering and commercial-grade quality of a Lazer Z zero turn riding mower, but in a value package. It features the same welded, heavy-duty, 1.5”x 3” tubular steel unibody frame found throughout our Lazer Z models. You can also choose from two rugged Kawasaki® V-Twin engines or a Kohler® Command™ EFI engine matched to a full-floating, UltraCut™ Series 4 cutting deck, in 48, 52, 60 or 72 inch widths. A digital operator diagnostic module simplifies system monitoring and troubleshooting, while the fuel gauge uses ultrasonic waves to provide a more accurate reading. Comes equipped with a full-suspension seat that enhances operator comfort. Seat: Deluxe, bolstered suspension seat with Elastomeric Vibration Control material. Adjustment: Fore and aft from Operators’ Position. Drive Description: Two Exmark exclusive Parker unitized pump and wheel motor systems with no hoses, 1.7-quart integrated reservoir, spin-on filter and heavy-duty components. 12 cc pumps and 14. 5 cubic inch motors. Speed: Infinitely variable speed selection from 0-8.0 mph (12.9 kmph) forward, 0-5.0 mph (8.1 kmph) reverse. Cutting Heights: 1.0" (2.5 cm) to 5.5" (11.8 cm) in 0.25" (0.64 cm) increments adjustable from operator’s seat. Drive: 23 in.x 9.50-12 in. ; Caster: 13 in.x 5.0-6 in.